Fairytales from your country is Evi’s theme for the book page swap at Fibre Fever. I choose a fairytale written by Annie M.G. Schmidt called Spikkeltje. 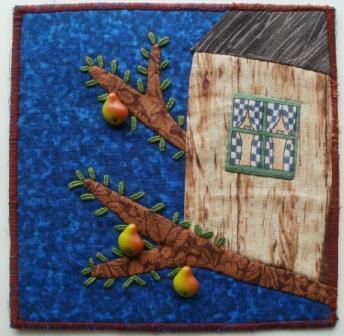 One of the characters in this story is witch Akkeba, who lives in a pear tree. The tree and the tree house are hand appliquéd. The leaves are woven detached chain stitches with cotton a broder. 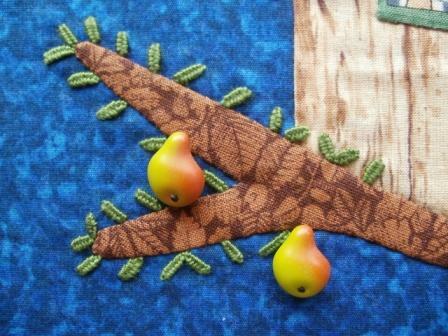 Luckily I had some pear buttons in the right size! Take a closer look at this page here. This is so charming and would make an excellent illustration in a child's fairy tail book.